How do you follow the most iconic scene in the history of comic books? Spider-Man has conquered his inner demons; exorcised his albatross; saved his Aunt and demanded fair pay from his boss. So what happens next? Steve Ditko needed to come up with something very special indeed if he was going to surpass the legendary Spider-Man-lifts-something-really-really-heavy sequence from #33. He needed something that would make our collective jaws drop; something which would change Spider-Man forever. He needed something which every previous issue had been building towards, and which would affect every issue to come. And dammit if, just for a second, it doesn't look as if he is going to pull it off. It comes, as all great scenes do, from nowhere. 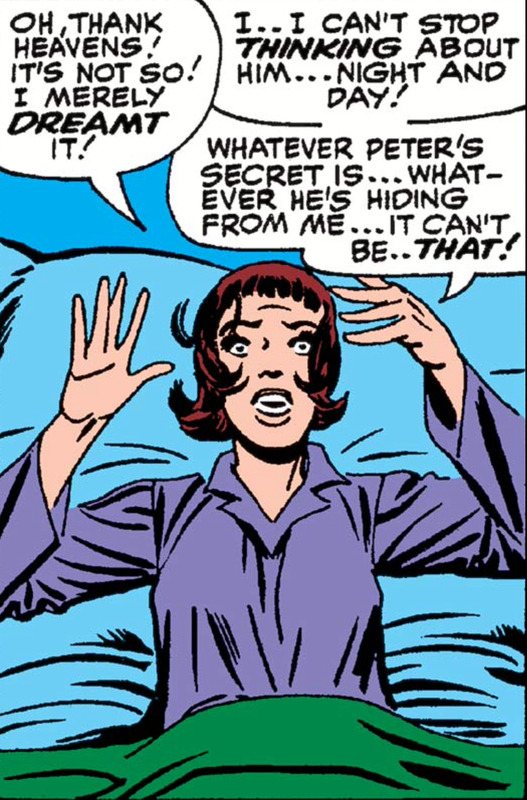 After twenty seven issues of dancing around the question, Betty Brant asks Peter Parker directly: "I know you are keeping some terrible secret from me; you must tell me what it is." And after all the lies and hypocrisy, Peter Parker gives her a straight answer. He calmly climbs up the wall, hangs upside down from the ceiling and rips open his shirt. "Peter?" he says "That's just one of the names I'm known by. I also answer to another name. The name of Spider-Man." He pronounces the last word in blood red letters, Jessie Custer style, just in case Betty misses the point. 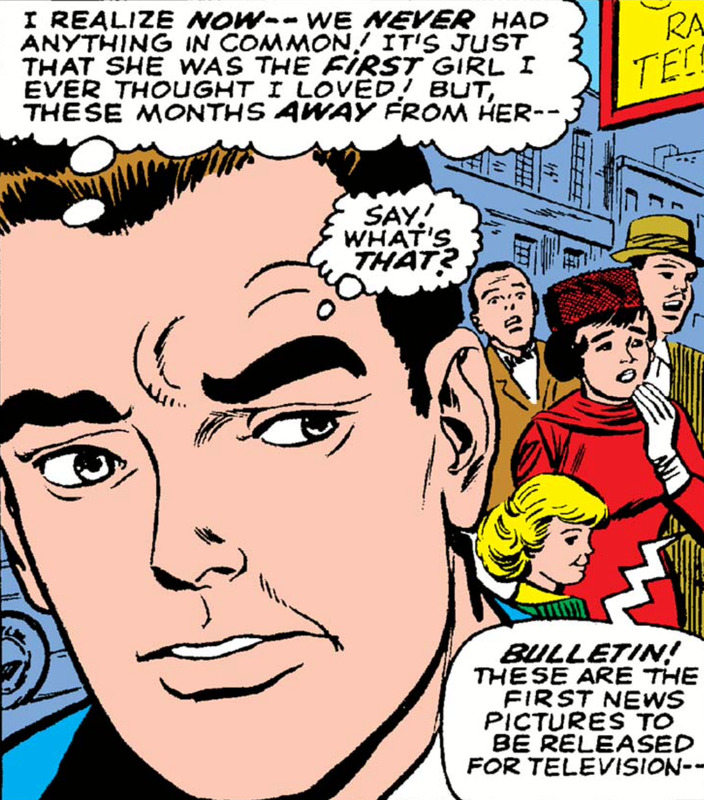 Betty Brant was never meant to be Lois Lane. She drifts through issues #2, #3 and #4 as a background character; only in #5 does Peter Parker notice that she's really pretty, and not until #6 does he ask her out. It isn't clear Peter and Betty ever go on what you would really call a date; but issue #7 ends with them chastely embracing behind Mr Jameson's desk. It's a lovely ending to one of my favourite Spider-Man tales. Geeky Peter has stopped whimpering and found someone he really gets on with. 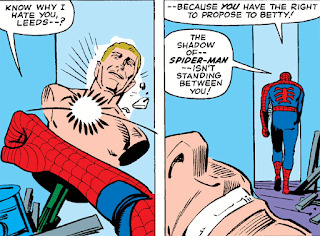 But a happy relationship does not a story make: and an engagement would have spoiled Peter Parker's teenage appeal. So Stan and Steve set about making the path of true love as rough as they possibly can. First they turn Betty Brant into "the girl with the dark secret". She cryptically refers to a mysterious tragedy in her past; and she appears to be being blackmailed by the Mob. This is resolved in issue #12: it turns out that her brother Bennet was in debt to organized crime. When Bennet is murdered, Betty conceives an irrational hatred of Spider-Man. This defines Peter and Betty's relationship for the rest of the Ditko years. He can't ask her to marry him unless he first tells her who he really is, but if he tells her who he really is, she won't want to marry him. The nice girl who shared Peter's sense of humour has morphed into a tragically unattainable courtly heroine. From issue #13 onward, Betty is redefined as "the jealous woman." She thinks that Peter is dating Liz (who he doesn't particularly like); she thinks he is dating Mary Jane (who he has never even met); she thinks he is dating the Human Torch's girlfriend (who he kindly returned a lost wallet to); and she thinks he is dating Hollywood starlets (because he is covering a movie for Mr Jameson.) 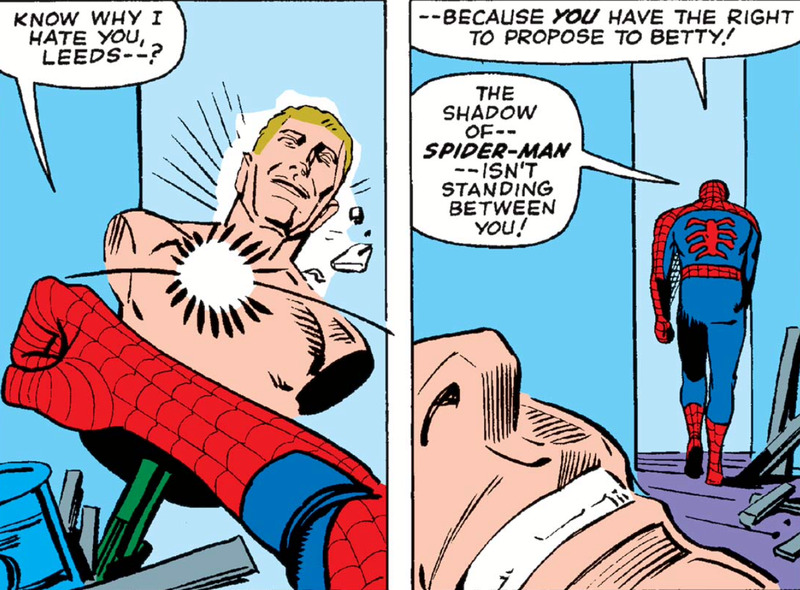 In fairness, Peter gets to play the role of "the jealous guy" from #18, when Betty's too-good-to-be-true boyfriend Ned Leeds appears on the scene and immediately leaves the country. Just when things seem to have settled down, Ned comes home (#29) and promptly asks Betty to marry him (#30). When Peter finds out about the proposal, he and Betty have a shouting row, which ends with him telling her to go ahead and marry Ned and her shouting "It's you I love" through the slammed door. They break up all over again in #33, with Betty first running after Peter and then running away from him. In #30 her inner monologue is preoccupied by Peter Parker's mysterious secret; in #33, she is more concerned about his dangerous line of work and apparent hunger for action. Peter Parker has a Big Secret. Peter Parker gets himself into dangerous situations. Peter Parker sometimes gets beaten up. Peter Parker takes pictures of Spider-Man. But Betty Brant cannot draw the obvious conclusion even when her unconscious is screaming it in her face. "Oh thank heavens! It is not so! I merely dreamt it! Whatever Peter's secret is...it can't be that!" When Doctor Octopus unmasked Spider-Man in issue #12, the cover copy screamed "Not a dream! Not an imaginary tale!" This is a little bit unfair to Marvel's Distinguished Competition: imaginary stories were invariably announced as such on page 1; they were never used as devices to trick the reader. But Marvel never really went in for Imaginary Tales. In the 70s they had a magazine called "What If? ", but there is a philosophical, or at any rate grammatical difference between a story about what "may" happen in some hypothetical future, and a story about what "might have" happened in some alternate present. "What would happen if Lois Lane had Superbabies?" is a very different proposition from "What would have happened if Uncle Ben had survived." But dream-endings certainly were used as a means of tricking the reader; and they were always very annoying. In this case the trick only lasts for a few panels, but it is still very irksome. It hurts to be told that something has happened, and then to be told that actually, it hasn't happened after all. It hurts to be shown something as interesting as Spider-Man unmasking and not to be allowed to see what follows from it. And it hurts a great deal to realize that the only remaining avenue of character development has been closed off. Now that she has dreamed the bleedin' obvious fact that Peter is Spider-Man, there is zero chance that Betty is going to put two and two together in real life. And now that we have seen Peter Parker tell Betty the truth in a dream, there is zero chance that we will see him come clean in the waking world. We thought we were getting a resolution: what we actually got was a declaration that this story-line is never going to be resolved. In issue #38 Ned Leeds comes home. It turns out that he didn't elope with Betty: he went to California on private business and has no more idea than Peter where she went. Ned blames Peter for driving her away, and tells Peter that he has proposed to her, even though Peter knows, and Ned knows he knows. The two guys have a fully fledged shouting match. Peter's internal monologue is even more chauvinistic than usual: he is still banging on about how Betty would never accept him as Spider-Man, and then adds "But I can't be sure. No-one can predict a female's reaction!" He spends the rest of the issue worrying about Betty (patronizingly calling her "the kid") and then punches a shop window mannequin because it looks slightly like Ned Leeds. "You know Why I hate you, Leeds... Because you have the right to propose to Betty! The shadow of Spider-Man isn't standing between you." I think that Ditko was going somewhere with all this. Betty has gone somewhere to do a thing, and Ned Leeds is using his Investigative Reporter skills to find out where and what. But Steve leaves the building without giving Stan any clues as to how the story was going to develop; and within two issues Stan has allowed it to fizzle out like a second hand firework. Is it perhaps even possible that the Ned/Betty plot was supposed to be connected in some way with the Norman Osborn plot? Steve was laying the groundwork for a Big Reveal about Norman Osborn in his final two issues, fueling the speculation that it was a disagreement about this plot line that caused the greatest partnership in the history of comics to come to an end. Of course, we now take it for granted that the Mysterious Mr Osborn turns out to be [SPOILERS FOLLOW] the Green Goblin. But Romita's first two issues (#39 and #40) follow awkwardly from Ditko's last ones (#37 and #38). As late as 1974, Marvel's in-house magazine FOOM was claiming that Ditko intended Ned Leeds to be the Green Goblin, while Stan Lee was still wedded to the Aztec Mummy idea... Some people think that there is some significance in Ned Leeds' green tie, and in the fact that the tailor's dummy has a big grin on its face. This is a really big stretch. But I can't believe that two characters would have gone off on mysterious journeys if there wasn't supposed to be some revelation about their destinations. So, in Romita's first issue, Parker meets Ned again, and they mutually apologize for their row. Peter tells Ned that he's "out of the running" for Betty and tells himself that he will now "put her out of his mind" forever. (Peter may be turning into a hipster, but he still regards women as prizes which men compete for.) In issue #40, Betty gets to do some soliloquizing of her own. Apparently what happened was that she woke up from her bad dream and hopped on a train to Chicago (some 800 miles away) but is going to come home because "a girl can never run away from a decision". But...but...I thought the whole reason for her leaving town was to enable her to make a decision? She says that she still hates to hear Spider-Man's name; but is more worried about whether Mr Jameson will give her her old job back. "And if he does...what will it be like, seeing Peter Parker and Ned Leeds again? And what will they say when they see me? 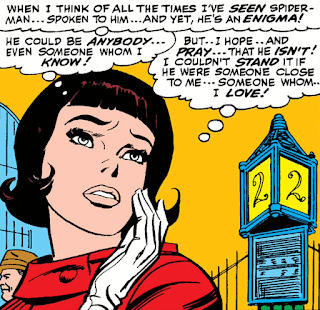 Will there still be a place in their lives...for Betty Brant?" "As you've probably guessed by now, the pages you've just read are a typical Marvel device for bringing new readers up to date as painlessly as possible! We just didn't want you to think that you'd picked up a romance book by mistake." Betty finally gets back to New York in issue #41, and the romance which has been coming to an end since issue #11 grinds to a resounding nothing. Betty tells Peter that she has had a nice time on the coast. It follows that her business in Chicago was so secret and mysterious that she is prepared to lie to both Peter and Ned about where she has been. Or that she went to Chicago via California, a detour of barely two thousand miles. Or else that Stan Lee has completely stopped paying attention. Peter and Betty have an awkward conversation until Ned turns up, and then Peter makes his excuses and leaves. On his way, he performs a short aria. "All these months I thought about her, dreamt about her, longed for her!! So now she's returned...and nothingsville. Whatever we had before, whatever there was between us...it's gone." But so far as we know, Peter has not been thinking about, dreaming about, and longing for Betty. Rather the reverse: Betty has been standing on railway stations wondering why the figure of Spider-Man haunts her dreams; while Peter has been basically resigned to the fact that the relationship can't work and has even started flirting with Gwen. Stan Lee has gone for one of his soft-resets: the idea that Spider-Man has driven the two star-crossed lovers apart fades out; the idea that Betty even cares about Peter's secret evaporates. It turns out that they have just outgrown each other. This doesn't stop Peter having a jolly good wallow, and like all adolescents on the rebound he denies that his feelings about Betty were ever real. "Once I thought I couldn't live without her. Now she's just another girl named Betty. Boy have I grown up in these past few months! I realize now we never had anything in common. It's just that she was the first girl I ever thought I loved!" 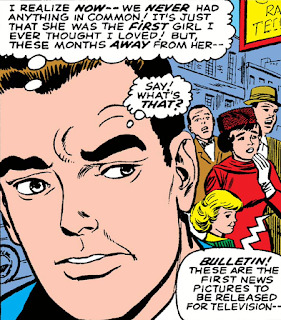 And so, no more of Betty Brant. In #42 she is shown working for the Daily Bugle again; and in #43 she is showing off the engagement ring that Ned has bought her. By then Peter is actively courting Gwen Stacey and Aunt May has succeeded in introducing him to his glamorous neighbor Mary Jane. It would be a hundred issues before Ned Leeds and Betty Brant finally got married. A hundred issues after that, it turned out that although Ned was never the Green Goblin he was the Hobgoblin. Sort of. He is killed off in in an issue of Wolverine. For fans, do these sub-plots to nowhere in particular enrich or detract from the overall experience of being a fan? They seem pretty unsatisfying when considered in terms of the individual stories, but do they make the "comic book world" as a whole seem more real, with their roads not travelled? I think it may need another essay to answer it. And it doesn't even have the decency of being a good issue of Wolverine.